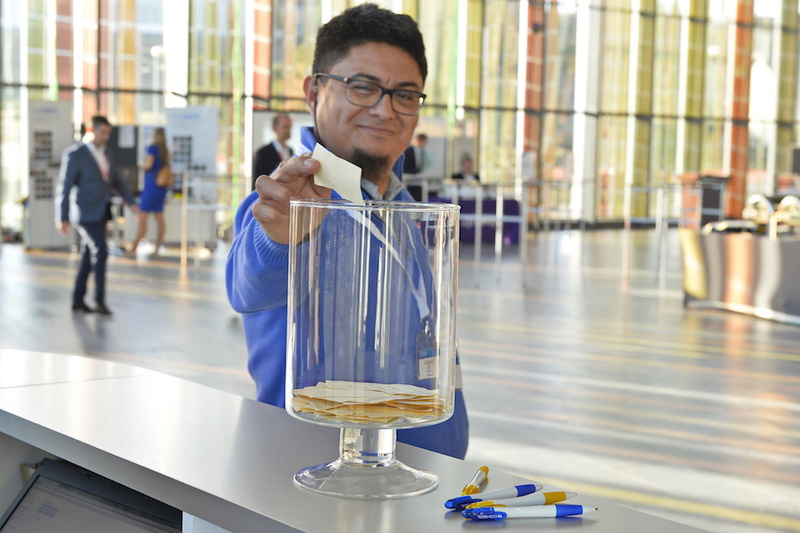 The COMSOL Conference 2018 Lausanne provided attendees with an exciting taste of all that Switzerland has to offer, including a musical performance by alpine horn players, a traditional Swiss wine and cheese reception, and a trip to the European Organization for Nuclear Research (CERN) in Geneva. Just as diverse were the research presentations given by conference attendees, who traveled from around Europe, and as far as South Africa, to discuss their innovative work with our multiphysics simulation community. Out of the many impressive and innovative presentations from the COMSOL Conference 2018 Lausanne, there were a few papers and posters that stood out among the rest. Some of the award recipients from the COMSOL Conference 2018 Lausanne. From left to right: Igor Danilov, Vincent Bruyère, Patrick Namy, Serge Charron, John Speyrer, Roland Rozsnyo, Karol Bugaj, Richard Wilson, and COMSOL CEO Svante Littmarck. The Large Hadron Collider (LHC) is ~100 meters underground on the CERN campus in Geneva, Switzerland. E. Cano-Pleite, A. Amorim, J.S. Swieszek, K. Artoos, and O. Capatina work on the High-Luminosity LHC (HL-LHC) project, where they design superconducting RF (SRF) crab cavities to help the LHC achieve instantaneous luminosities that are larger than the nominal LHC luminosity by a factor of five. In their award-winning conference paper, the researchers detail how they validated their numerical model against experimental results from tuning a prototype of their crab cavity design. They then continued with their design of another cavity, using the COMSOL® software to analyze and optimize important design parameters. Read more in the COMSOL Conference 2018 Lausanne paper. 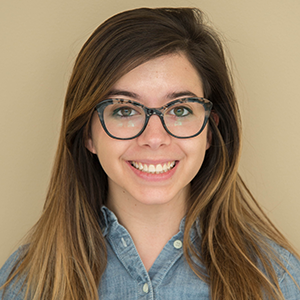 S. Morville, V. Bruyère, and P. Namy from SIMTEC won a Best Paper award for their research on gas tungsten arc (GTA) welding, a popular assembly process for metallic components in many different industries. In order to optimize welding techniques, the SIMTEC researchers simulated the GTA welding process to understand and predict welding behavior and the impact of the welding parameters. They focused on modeling the free surface deformation as well as a wide range of multiphysics effects, such as Joule heating, Marangoni effects, and surface tension. The results of their welding simulations were validated by both experimental data and literature. Read the research paper on GTA welding here. Plasma electrolytic polishing (PeP) is more environmentally friendly than electrochemical polishing, but it requires a higher voltage. Researchers I. Danilov, M. Hackert-Oschätzchen, I. Schaarschmidt, M. Zinecker, and A. Schubert from the Professorship Micromanufacturing Technology at the Chemnitz University of Technology, Germany, used modeling to investigate the electric potential distribution and current density distribution during the PeP process for stainless steel. They found that the electrochemical machining process can be modeled in the COMSOL Multiphysics® software, and they plan to continue their simulations and validate them with experimental data in the future. Read the paper on plasma electrolytic polishing here. On the second night of the COMSOL Conference 2018 Lausanne, attendees were able to mill about during the poster session, checking out the various research posters and discussing them with the presenters. People also submitted votes for their favorite poster. The winners were tallied and announced along with the Best Paper award winners later that night at the gala dinner. 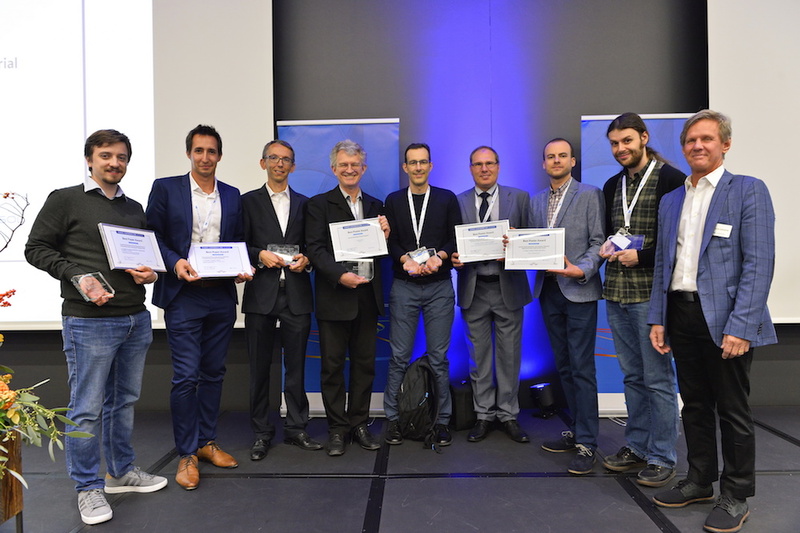 The Best Poster awards at the COMSOL Conference 2018 Lausanne were chosen by popular vote. There were three award winners among a wide selection of impressive posters. Browse the crowd favorites below. In a country known for its timepieces, it comes as no surprise that Serge Charron from Intermezzi won a Best Poster by Popular Vote award for his multiphysics model of a minute repeater in a watch. Charron used the COMSOL software to compute the acoustic fields and then compared the results with tests, which showed a 90% agreement of the eigenmodes. He also created a simulation application for setting and tuning watch timbres and used the COMSOL Server™ product to deploy the application to watchmakers and manage its use. Read more about the research behind the award-winning poster here. We’ve already blogged about Kejako’s groundbreaking research into modeling the human eye. For their award-winning poster, chosen by popular vote, J. Speyrer, A. Maurer, D. Enfrun, and R. Rozsnyo of Kejako SA and MNCM/HES-SO used the Application Builder tool in COMSOL Multiphysics to build an application based on their proof-of-concept model of the crystalline lens of a pig eye. The application was used to let nonexperts in simulation find shear modulus values for the crystalline lens. One of the main takeaways of the researchers’ poster was how simple and straightforward it was to create a specialized user interface on top of their model. Learn more about Kejako’s research involving simulation applications here. The operation of industrial machinery can be so loud that it causes harmful environmental effects. At Sonobex Limited in the U.K., K. Bugaj, L. Chalmers, D.P. Elford, and R.D. Wilson used simulation to look into the potential uses of acoustic metamaterials for blocking the noise propagation of this type of machinery. The researchers used acoustics modeling software to investigate their designs and were able to strike a balance between noise reduction and ease of manufacturing. Learn more about the acoustic metamaterials research here.